Class I myosins are single-headed molecular mechano-enzymes, or motors, that translocate actin filaments in vitro. They constitute the largest group of unconventional myosins. Found in many different organisms from protists and yeast to vertebrates, they are often associated with membranes. Class I myosins are diverse in structure, regulation and function. They are responsible for the ultrastructure of intestinal microvilli; they function as the adaptation motor in the stereocilia of the inner ear; they are implicated in transcription regulation; and they modulate cell adhesion and motility in the immune system. 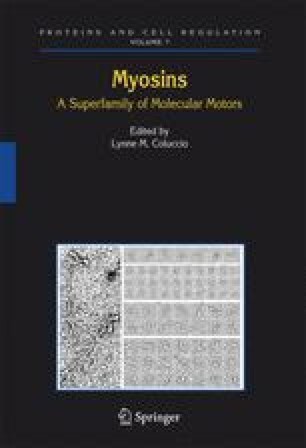 Many of the observed effects are a consequence of the ability of myosin I to modulate actin function by coupling the cytoskeleton to the membrane, crosslinking actin filaments and/or modulating actin assembly.